Well, all I need to do is make it thru at least half a day's work and then stress a little more about whether I've packed everything I need, enjoy a last dinner with Varen and hop on my plane at some un-godly hour. I do however have one last quick review ... 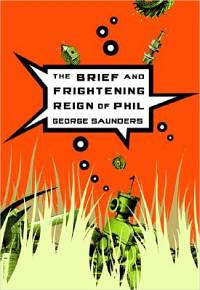 I especially picked this book after The Apologist since I knew it would be a quick read and I could get it done before I left: George Saunder's The Brief and Frightening Reign of Phil. Citizens waiting to enter the country of Inner Horner, a strange land that is only large enough for one resident at a time, fall prey to the tyrannical rule of the ambitious and power-hungry Phil, igniting an outbreak of injustice and mass hysteria, in an unusual novel by the author of Pastoralia. Original. A quick and truly bizarre read. I'm guessing I didn't pick up all the political innuendos but it was otherwise fairly entertaining and definitely had some amusing bits! Not for you if you require realism ;) In my defence, I did only buy the book because of it's fantastic title!